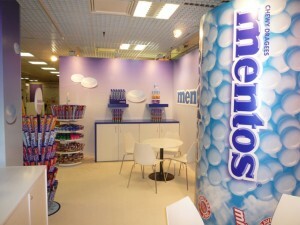 Perfetti Van Melle is a candy and chewing gum manufacturing company based in Milano, Italy. It operates more than 30 divisions and its products are distributed to more than 130 countries. In March 2001, Perfetti SpA of Italy and Van Melle from the Netherlands merged to form Perfetti Van Melle. The history of Perfetti dates back to 1946, when Ambrogio and Edigio established the company in Lainate in Milan, Italy. They introduced the first chewing gum entirely made in Italy, and named it Brooklyn. It was commonly known as la gom ma del ponte. In 1968, the company created Gum Base, which is the basic product used for the manufacturing of chewing gum. Later, it started selling Gum base to many confectionery manufacturers around the world. During the 1970’s, more products were introduced including Big Babol, Vivident, Happydent, Morositas, Alpenliebe and Vigorsol. Over the years, the company expanded and more products were introduced. It emphasized customer satisfaction and keeping up-to-date with the changing trends in the market. More expansion took place in the next 2 decades. Over the next few years, the company acquired some major brands like Caremoli, La Giulia, Gelco and Frisk. Van Melle was founded by Izaak van Melle as a bakery in 1841 in Breskens, Netherlands. An employee showed him how to prepare sugar for making candy and van Melle started into the candy making business. In 1882, Izaak’s son took over the business and expanded it with larger facilities and more products. Within a few years, it became one of the popular companies in the area. When it was destroyed in the Second World War, it was relocated to Rotterdam. In the 1930s they introduced Fruittella and Mentos candies. With this, it expanded to most parts of the world. In the 1980’s, the company moved to larger premises and the production was increased tremendously. It also acquired many other companies like Look O Look, Gebr, Peco and Verdujin. It also expanded its business to Asia and Europe. After the mergence, new production facilities were opened in Russia and Bangladesh. In January 2005, the company merged again with Chupa Chups, makers of lollipops; and Lofthouse Fleetwood, makers of Fisherman’s Friend lozenge. They further expanded business into Germany. In 2007, two new manufacturing plants were established in India and Vietnam. In 2008, more factories were built in Shanghai and Spain. A Chupa Chups manufacturing plant was opened in Sant Esteve Sesrovires in 2009. Company headquarters: Via XXV Aprile 7, 20020 Lainate, Milano, Italy; Breda, Netherlands.